I first started seriously focusing on music when I was around 13. I took some guitar lessons, and started by recording original songs onto my PC with my MIM Strat and Shure 58 into a Tascam US-224 (which I was using until Fall 2005). Over time I started playing drums, keyboard (albeit with little technique) and bass guitar, and getting into different kinds of music. I subsequently became aware of the Flaming Lips, who were a key inspiration, and then '70s progressive rock (particularly Yes, and eventually Gentle Giant), which would define the musical ambitions from which most of the work on this website sprang. I have loved Early Music (Medieval, Renaissance, Baroque) for some time and that, along with a newfound interest in contemporary classical, has become an increasingly central focus as of early 2007. This is one of the factors that has resulted in my pursuing classical composition as a primary occupation. More information about my new work can be found at my composition site (under a different name, Nell Shaw Cohen). All of the recordings on this website were made by solo multi-tracking, overdubbing the instruments on my own. 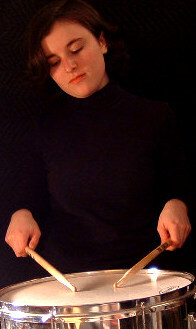 As for band experience, I played drums in a San Francisco group called VanDyke Pajama for about half a year before I permanently moved to New York in September 2005. For a period I played guitar in the East End "all star" Youth Jazz Ensemble of Long Island, NY. I record with the Firepod Presonus (Firewire audio interface with 8 tracks for simultaneous recording) hooked up to my PC, where I mix using Cubase. Microphones I use are AudioTechnica AT3035, Studio Projects C4 stereo pair, Shure SM58 and Unidyne III. My primary electric guitar is a Gibson ES-137 Classic, which I bought in early 2005. Its name is Apollo. I also have a Fender Stratocastor (named Spot). I play a Martin 000X1 steel-string acoustic (named Bean) and a Hohner classical nylon-string, which is my cheapest guitar but a treasured favorite. I play a MIM Fender Jazz bass. All bass work prior to December 2005 was recorded using my '60s Kalamazoo short-scale bass (named The Crimson King). I use the EMU Vintage Keys synthesizer keyboard for everything (named Steve 4). My drum set is a Tama Swingstar 5-piece with various Sabian cymbals. I also use a glockenspiel, Cuatro (puerto rican guitar-related instrument, named Olly O' Sunhilly), soprano recorders, various percussion, tin whistles and so forth. "Tempus" features the compositions, production, vocals, guitar, bass, keyboards, drums and percussion of Nell James, an 18-year-old musician who cites the work of Yes, Gentle Giant, the Flaming Lips and Nektar as her major influences. A theme album loosely tied around the concept of time, "Tempus" tastefully merges elements old and new - '70s progressive rock and contemporary indie rock - with a spirit that is both wide reaching and philosophical, as well as personal and accessible, and decidedly different from most of today's prog or indie acts.